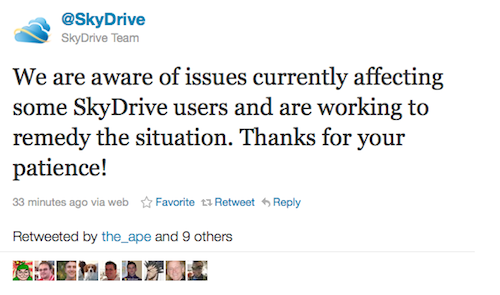 UPDATE: SkyDrive was back up at about 3:30pm PT as confirmed in this tweet. Original story follows. Microsoft's cloud service is down for some users, Microsoft confirmed on the SkyDrive Twitter feed at about 2pm PT today. "We are aware of issues currently affecting some SkyDrive users and are working to remedy the situation. Thanks for your patience!" reads the @SkyDrive tweet. UPDATE: The message across the top of the SkyDrive help page says, "There are currently multiple issues reported that may impact your ability to use our products and services." The message below that reads, "Windows Live Skydrive is currently experiencing issues with adding, editing, or removing files. You may also receive errors while publishing content with Windows Live Photo Gallery in an online album." Russell Colburn was the first on Twitter to ask about a problem at around 1:30pm PT: "@SkyDrive - I'm getting an error trying to connect to skydrive using my laptop and winphone. Is it me?" Brandon (@bc3tech) tweeted shortly after that, "in particular skydrive.com - i keep getting 'An error has occurred. Please try again.'" Launched in February 2008, SkyDrive offers 25GB of free storage for Windows Live users. In June, SkyDrive launched improved navigation, built-in groups and the ability to open Word and Excel docs in online versions of those programs. It also switched from Silverlight to HTML5 for viewing photos and videos.